Take Back SD 10 with Sen. Ted Cruz! RSVP Today! Our team is already hard at work gearing up for the May 27th Runoff Election! To kick us off, I want to invite you to our Take Back SD 10 Rally! There’s no doubt the Austin establishment was stunned on Election Night. Our strong, first place finish was one of the many conservative victories of the night, and now we need your help to push us over the Runoff finish line on May 27th. RSVP now to attend our Runoff Rally with Senator Ted Cruz, Rep. Matt Krause, and many more! The event is March 19th, just ONE WEEK from today, so get your free tickets while you can! P.S. Part of our grassroots army on Twitter? 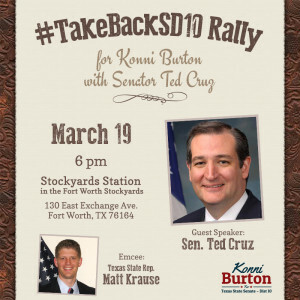 Be sure to use the hashtag #TakeBackSD10 and tell your friends to RSVP for the event!